Hotel Casa Garzotto is located in the centre of Rovinj, the hotel has style of past centuries (from 19th to 20th). In the hotel there is original furniture from the 19th century, details of its history and tradition. This exclusive quiet hotel located in the heart of Rovinj will not only suit those seeking classical beauty, but also offers all the comforts of practical, modern living. Hotel has 4 studio apartments approx. 35 sqm, each decorated in their own individual style and two apartments have open fire-places which, in winter, creates a special atmosphere. A rich and varied buffet breakfast is served in the tavern bar on the ground floor. Hotel Monte Mulini was opened in 2008 and it is an exclusive oasis of luxury and elegant leisure, situated near the picturesque town of Rovinj. Situated in a beautiful and quiet location, but close to the town as well, Monte Mulini is the perfect starting point for sightseeing of beautiful Rovinj city. In hotel there is 109 beautiful rooms, 10 exquisite suites, several extraordinary restaurants and an impressive wellness centre. All rooms and suites have balconies, with panoramic views of the picturesque cove and protected Zlatni rt park forest. Hotel Istra Rovinj is situated on island of Sv. Andrija which is one of the most beautiful islands of the Rovinj Archipelago and only 10 minutes distance by boat from centre of Rovinj. Hotel is built in modern design and there is beautiful wellness centre, in hotel surrounding there is kilometres of organized promenades and full traffic isolation. The Istra Hotel has 326 rooms and suites. All accommodation units are equipped with air conditioning, sat & pay TV, mini bar, safe, telephone, Internet and one apartment for disabled persons. In this Hotel pets are not allowed. The Apartments Amarin is placed in nice green oasis and it is located about 4km north of Rovinj, right next to the sea. The outdoor pools are almost on the white pebbled beach so you can enjoy the sensation of being at the waters edge, yet in the comfort of your hotel. Amarin offers 271 renovated apartments, 124 not renovated apartments and 180 rooms. Pets are allowed with extra charge. 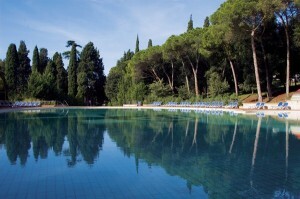 Hotel Eden Rovinj is placed in peaceful location on the edge of a 100-year-old nature park in Rovinj. It offers outdoor and indoor pools and free beach chairs and parasols in its own bay. It is located on the very edge of the Zlatni Rt park forest, 200 m from the sea, 170 m from the sport facilities, 2 km from the town centre. Hotel Eden provides its guests with the opportunity to enjoy in relaxed atmosphere. It is characterized by rich equipment of the rooms, pleasant public areas, and terraces offering spectacular views. In Hotel Eden there is 325 rooms and pets are not allowed. Resort Villas Rubin are situated in the south part of Rovinj’s coastal area, Villas Rubin Resort is a true little tourist town containing all you need for a carefree holiday.The resort is located right next to a well-tended pebble and stone beach, 3 km from the town centre by road and 7km by coast through the recreation zone. Landscaped lawns, olive trees, shades of pine trees and wonderful rocky and gravelly beaches give this resort an idyllic atmosphere, while its accommodation capacities and numerous facilities will ensure comfort and diversity of experience. Pets are allowed with extra charge. The Heritage Angelo D`oro, formerly a Bishop’s Palace from the 17th century, is an elegant boutique hotel in Rovinj´s historic pedestrian centre. Whether one are looking for a nice place for your vacation or you just want to relax and enjoy the culture in one of the nicest historical towns of Europe, in the hotel which is open all year round guest will certainly feel at home. Most of the rooms afford a splendid view of the sea or the hotel garden and the cathedral. A small wellness centre featuring a sauna, a solarium and a Jacuzzi, which are all free of charge, is available as well. The popular bathing rocks of the old town are only 100 meters away from the hotel and the public Taxi-Boats will bring you to the bathing beaches and offshore islands. 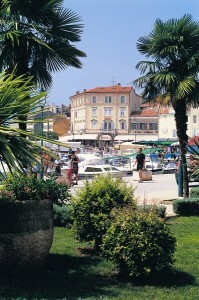 Hotel Adriatic is located on the main square, heart of Rovinj on the central square called the Adriatic. It is the oldest hotel in Rovinj offers a direct experience of this unique Mediterranean town. The attractive Central European ambience of the hotel supplements the Venetian architecture dominating the square. The romantic hotel coffee shop is just a few steps away from the maze of narrow streets leading to the old town. There are 27 rooms in the hotel and distance is 300m from the nearest town beach. Hotel Park Rovinj is situated right by the shore above the marina, offering a delightful view of Rovinj’s old town and the island of Sv. Katarina. This holiday hotel is located away from the hustle and bustle of the city, but still near the town centre, just off the beach as if nestled into the scents of the clime and vegetation. The hotel’s offer comprises a wide range of holiday amenities and services, including its swimming pools offering a view on the town and the beautiful promenade with a series of restaurants and bars below the hotel. The Valdaliso in one of the top Hotels in Rovinj, its annexes are situated on a green peninsula, just a few minutes by car from the scenic ancient centre of Rovinj. Hotel and Annex Valdaliso are situated around 4 kilometers north of Rovinj and 50 m from the beach, offering a magnificent view of the old town core. Having a kilometer-long gravelly and rocky beach, the “Valdaliso” is an ideal place for a carefree holiday for people who love swimming in the crystal clear sea and tanning under the warm sun. In Hotel there is 289 rooms (121 in the hotel and 168 in the annex), Internet point and partially covered by WIFI network. 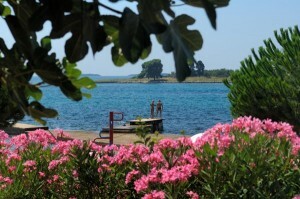 Hotel Katarina is situated on a wonderful island opposite the historical core of Rovinj. The island, sharing its name with the hotel, is the second biggest island within the Rovinj Archipelago. It features abundant Mediterranean vegetation, organized promenades and 19th century parks, magnificent views of the town, Zlatni Rt park forest and the rest of the Rovinj Archipelago. There are historical remains of an old castle integrated in the hotel and that is giving to the Hotel a touch of Austro-Hungarian romance. The Katarina has a total of 120 accommodation units of which 61 in the main building and 59 in the annex. The boutique-style Villa Tuttorotto features individually decorated rooms overlooking Rovinj’s harbour and pine forests. There is a marble staircase, authentic art objects and antiques at the Villa. Villa Tuttorotto offers a lounge area with comfortable sofas. In the evenings a wide selection of local and international aperitifs is served. Guests can start their day with a gourmet breakfast in the dining room or on the sunny balcony. You can also benefit from the room service and enjoy your breakfast in bed while watching the port and the fishermen.